The long awaited opening of The Broad designed by Diller Scofidio + Renfro, in collaboration with Gensler, is scheduled for September 20 in Downtown Los Angeles. In anticipation of the big day, the museum released details about the inaugural installation that will fill the 35,000 square feet of column-free gallery space on the third floor. Curated by founding director Joanne Heyler, the rather chronological show will feature artworks by the heavy-hitters of the twentieth century drawn from the postwar and contemporary art collection assembled by philanthropists Eli and Edythe Broad: Jasper Johns, Robert Rauschenberg, Ed Ruscha, Andy Warhol, Roy Lichtenstein, John Baldessari, Mark Bradford, Jeff Koons, Barbara Kruger and Kara Walker. For fans of immersive experiences, the first floor will feature one of the Broad’s newest acquisitions, Yayoi Kusama’s Infinity Mirrored Room – The Souls of Millions of Light Years Away. 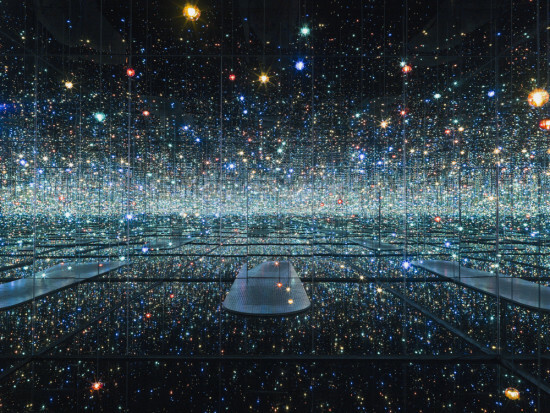 The mesmerizing, cosmic chamber filled with an uncountable number of LED lights drew crowds around the block when it was exhibited David Zwirner Gallery in late 2013. Other recent works comment on the issues and crises facing contemporary culture and the built environment. Takashi Murakami’s 82-foot-long painting—a reflection on Japan’s recovery from the catastrophic 2011 Tohoku earthquake and tsunami. Robert Longo’s 2014 charcoal drawing Untitled (Ferguson Police, August 13, 2014), depicts police protests in Ferguson, while Cairo (2013) by Julie Mehretu captures the atmosphere and social unrest the Arab Spring in a large-scale, architectural, ink-and-acrylic drawing.